The attack targeted Siraj Raisani, a Balochistan Awami Party candidate for parliament running in the July 25 general elections, and his supporters. Raisani died as a result of the blast, which came after a motorcycle bomb attack earlier in the day in the northwestern town of Bannu targeted a convoy transporting former Housing and Works Minister Akram Khan Durrani, who escaped unharmed. 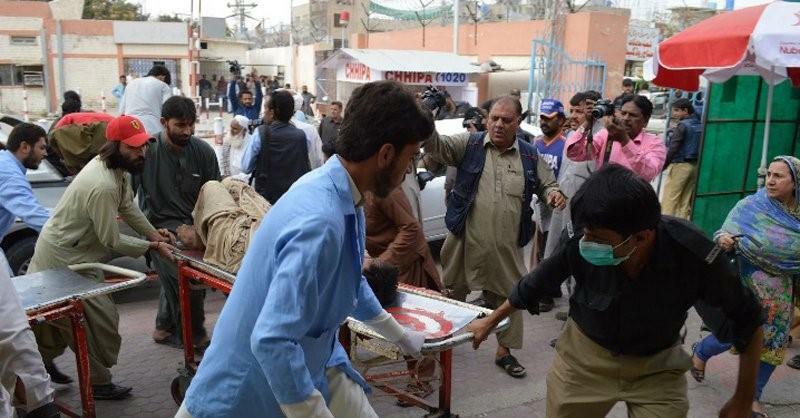 At least four people died in the Bannu attack with at least 32 wounded. A local hospital official in Mastung said, "we've run out of space in the mortuary" and security officials cited over 271 injured based on incoming casualties. Video footage and photographs showed a grizzly scene with dead and wounded lying nearly on top of each other under a cramped outdoor tent. One local government official condemned the attack as “a conspiracy to sabotage the electoral process in the province,” according to a statement. Pakistan is currently on edge ahead of July 25th elections, and after a recent spate of election-related bombings and assassinations. Also significant is that former Prime Minister Nawaz Sharif was arrested Friday as he arrived at Lahore airport from London. Security forces had put the city on lockdown to prevent planned huge demonstrations by his supporters. Sharif been given a 10-year prison sentence in absentia last week by a Pakistani court on corruption charges related to several previously undisclosed luxury properties in London, which were funded through offshore companies and holdings in a scandal revealed through the 2016 Panama Papers leak. Sharif and his daughter Maryam were taken into custody by officials from the National Accountability Bureau (NAB) without incident as they re-entered the country. His party, the Pakistan Muslim League, has dismissed the proceedings which initially stemmed from Panama Papers revelations as a political witch hunt orchestrated by Pakistan's army to discredit the former PM and his family. Sharif's first two terms ended abruptly under intense military pressure and the second by actual coup. Pakistan is bracing for more potential violence to come as a result of both Sharif's return and a string of attempted assassinations on political candidates ahead of the late July elections.